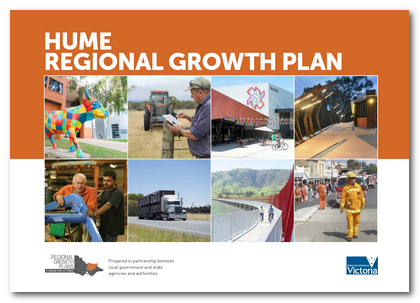 The Hume Regional Growth Plan covers the municipalities of Alpine, Benalla, Greater Shepparton, Indigo, Mansfield, Mitchell, Moira, Murrindindi, Strathbogie, Towong, Wangaratta and Wodonga. The plan provides broad direction for regional land use and development in the region and more detailed planning frameworks for key regional centres. Amendment VC106 changes the Victoria Planning Provisions and all planning schemes by inserting clauses 11.06 - 11.13 into the State Planning Policy Framework which set out the objectives and strategies of Victoria's eight regional growth plans. The Minister for Planning launched the Hume Regional Growth Plan on 23 July 2014. The plan has been endorsed by each of the twelve Hume Region councils following consultation with the community.